Investors have been hearing about an impending bear market since mid-January. That's because the Dow Jones Industrial Average tanked nearly 8% in the first 10 trading sessions of the year. Interestingly enough – there is no set bear market definition. Although, most investors agree a bear market definition says an index must drop 20% over a two-month period to be considered a bear market. We haven't quite hit that point yet, but the Dow Jones is now down 12.4% from the highs it hit in May 2015. 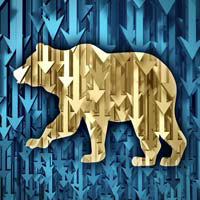 "More than 50% of S&P 500 stocks are now down 20% or more from their 52-week highs – and it is now a question of how loud the bear growls," Money Morning Global Credit Strategist Michal Lewitt said. The pressures of China's slowing economy and its volatile stock market have been pulling down markets here in the United States. "China is a house of cards whose debt-engorged economy hit a wall in mid-2014 after seeing its total debt grow from $7 trillion in 2007 to $28 trillion (it is now probably over $30 trillion)," Lewitt said. "This then caused global commodities markets, which were inflated by the Chinese debt explosion, to collapse." China, however, isn't the only reason we're in a bear market. "The last piece of the puzzle was the end of the Federal Reserve's quantitative easing (QE) program in October 2014 and the beginning of its effort to raise interest rates in 2015," Lewitt said, "though this didn't occur until last December and is more likely than not to be reversed in 2016 if markets continue to sell off and the U.S. economy continues to weaken." According to Money Morning Chief Investment Strategist Keith Fitz-Gerald, this bear market is being driven by fears of a weak U.S. and global economy. "The markets are all about sentiment," said Fitz-Gerald on the FOX Business Network. "They're a forward-looking animal and they're all about certainty or uncertainty, and traders now are uncomfortable with that." Despite all of these negative developments, investors still have a unique advantage in the markets. "Institutions have to keep their money moving," Fitz-Gerald said. "Good, bad, or ugly, they have to continue to trade. Individuals can be very careful and very selective." Even when stocks are being battered, investors can still make money. Money Morning Options Trading Specialist Tom Gentile helped his subscribers post a 100% return in the first week of the year, when the Dow declined by more than 900 points. Every week, Gentile discusses his favorite market plays. Check out his trading strategy here. Like Gentile, Money Morning Capital Wave Strategist Shah Gilani favors short-term plays during market downturns. He likes three exchange-traded funds (ETFs) that track the inverse performance of major indexes. These inverted ETFs gain as stock prices decline. Gilani also likes four short-term investments when markets are falling hard during a specific day. Get all of his picks, right here. For a more long-term approach, Fitz-Gerald favors investing in high-quality stocks that sell products the world can't live without. These are positions that you plan on holding for the next five to 10 years. Fitz-Gerald explains that stocks like these aren't speculation; they're dependable investments based on solid earnings reports and balance sheets.